Intermatic ET90000 Series 1-Pole 4-Circuit Astronomic electronic time switch in gray color, is rated at 30-Amps and 120, 208 - 277-Volt AC. It features On/Off action and SPDT contact configuration to provide maximum conductivity. It has contact rating of 10-Amps at 28-Volt DC resistive (NC), 20-Amps at 28-Volt DC resistive (NO), 3-Amps at 120 - 277-Volt AC ballast (NC), 20-Amps at 120 - 277-Volt AC ballast (NO) and 470 VA at 120 - 240-Volt AC pilot-duty (NO). This switch has USB terminal for connection. This switch accommodates wire of size 20 - 6-AWG. It has timing range of 365 days. This switch is suitable for school districts, banks, small hotels, franchises, retail stores, municipalities, parking lots and offices. 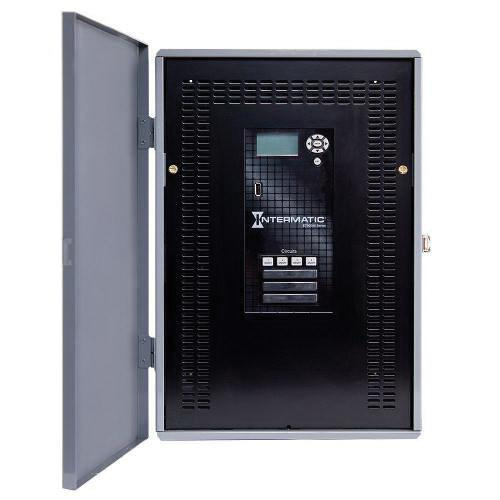 Time switch has non-volatile memory that protects programming indefinitely and super capacitor backup. Astronomic feature offers sunset On and sunrise Off settings to eliminate the need for separate photo control devices. It features Type 3R steel enclosure for rugged usage and longer endurance. It measures 322 mm x 138 mm x 454 mm. It withstands temperature rating of -40 to 40 deg C. Switch is UL/Title A20 listed and CSA certified.